Cata-what? Catalinas, Cats, Your Bucks. It’s all the same thing, but what on earth does it mean and how do they work? A Catalina is a coupon that prints out at the register at most grocery and some retail stores. They print out of their own machine, made by the Catalina company, hence the name. Why do they print? Sometimes they are just advertisements for services (those annoying oil change coupons), some notify you of upcoming or current catalina promos (i.e: Buy 2 Glade air fresheners, get $2 ONYO). Purchase-triggered catalinas print when you buy a certain number of items in a product family (see previous example). These are where the magic can happen! Manufacturer coupons – save a specific amount on a specific product. Just like the coupons that come in your Sunday paper, but they are usually only good at the store they came from. ONYO coupons – “Save $5 on your next trip”. You can use these on a second transaction, and they are great to offset the cost of meats, produce, and dairy items, which are costly and don’t usually have coupons. 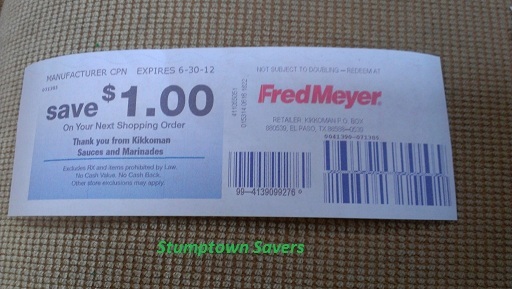 These can come as store coupons or manufacturer coupons, so make sure to check, especially if you are stacking. Do the same transaction again! Final Price: Free + $1 MM WYB 2 after Catalina!!! !